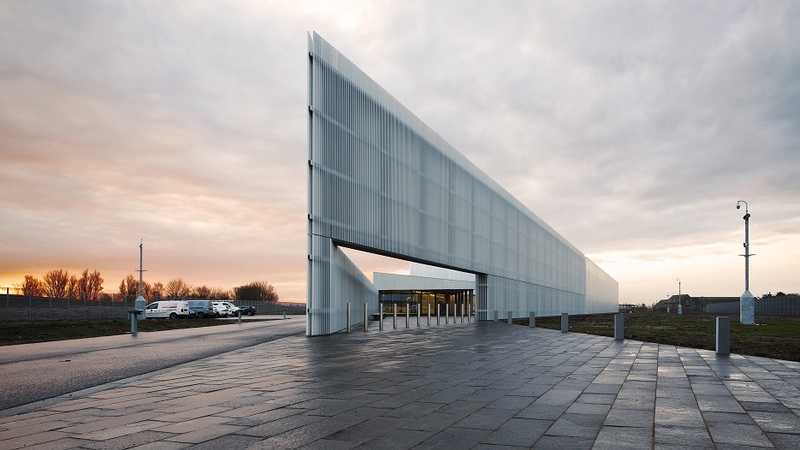 A national archive for the civil nuclear industry designed by Reiach & Hall Architects was last night awarded the Royal Incorporation of Architects in Scotland (RIAS) Andrew Doolan Best Building in Scotland Award for 2018. Located in Wick, Nucleus is an impressive industrial building which contributes to its context in this remote and challenging location in the far north of Scotland. The Nuclear Decommissioning Authority archive was among twelve projects shortlisted for the coveted prize. The award was presented at a ceremony at the newly opened V&A Dundee by cabinet secretary for culture, tourism and external affairs, Ms Fiona Hyslop MSP, alongside Mrs Margaret Doolan Hon FRIAS. The award is generously supported by the late Andrew Doolan’s mother and family and by the Scottish Government. Fiona Hyslop, said: “Good design in our built environment is a key mechanism for supporting our economic success, taking forward our environmental objectives, contributing to our cultural continuity and promoting healthy lifestyles. The judges for this year’s award were RIAS Past President Prof. Gordon Murray (partner, Ryder Architecture), this year’s Stephen Lawrence Prize winner Anna Liu (director, Tonkin Liu Architects) and, past Stephen Lawrence Prize winner, Murray Kerr (director, Denizen Works. The judges said: “The Caithness area has perhaps endured the greatest diaspora of any area of Scotland since the clearances, and the heritage aspect of Nucleus and its potential to assist in both a cultural and economic regeneration of the region cannot be overlooked. As well as a national archive of the UK’s nuclear power industry, it is also the repository of the social history of Caithness. This building has many stories to tell. “In an effort to give some depth of context to the rather anonymous site for the building on the edge of an industrial estate, the architects have drawn an allegorical tale on the landscape and big skies of the floe country and the magnificent horizontal light on which is founded the disposition of elements of the building- the pools of water and the triangular forms. However, for this jury, the rootedness of such a building firmly in the social and cultural history was a much more significant allegory. The building is a physical manifestation of the metaphysical, capturing both the identity and the nature of the space of its location.